Godzilla, one of the most recognizable characters in history who has become an icon of Japanese cinema since his debut in 1954, will once again take center stage in the new film by acclaimed filmmaker Gareth Edwards (Monsters). Edwards directs from a screenplay by Max Borenstein and story by David Callaham and Max Borenstein, based on the character “Godzilla,” owned and created by TOHO CO., LTD. Thomas Tull and Jon Jashni are producing with Mary Parent and Brian Rogers. Patricia Whitcher and Alex Garcia are serving as executive producers, alongside YoshimitsuBanno and KenjiOkuhira. 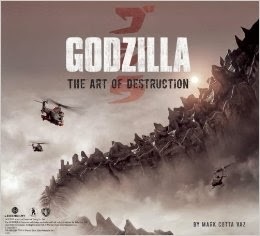 Sounds like something every Godzilla fan should have in their libraries, right next to the upcoming prequel graphic novel from Legendary! Will you be picking this one up for your collection?